Queensland Genealogy: Mental Patients - One List or Separate Lists? Mental Patients - One List or Separate Lists? 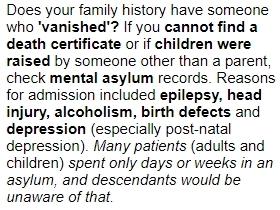 I've used 25 different series of historical records to create various indexes to mental asylum patients and people who were suspected of being of unsound mind. Names from some of the indexes are already on my Web site, but many more will be added soon. Would you like me to put those names on my Web site in one alphabetical list, with separate Web pages for names beginning with each letter of the alphabet? Or should I leave things as they are, with separate indexes for different 'mental' series, and (on my Web site) separate lists of names? Please vote for one or the other by adding a comment below. Thanks! Hi Judy Instinctively, I would go for names. That should be the one key attribute that a searcher should know. My wife looked for an Aunty - we had the place (sort of as Wolston Park has been known by many names. Having just been on your website, it has a search facility (tho I took a few seconds to find them both); so it really doesn't matter. What is the simplest for coding? Thanks for your comment, John. 90% of the people who have replied so far (via social media or private email) want one big list of names instead of a separate list for each record type (which is what's currently on the Web site). Anyone who hasn't thoroughly explored all of my 'insanity' Web pages probably doesn't realise that a combined list would have more than 10,000 names. My personal opinion is that users would find that the disadvantages outweigh the advantages, but I will give serious consideration to making the change if that's what people really want.